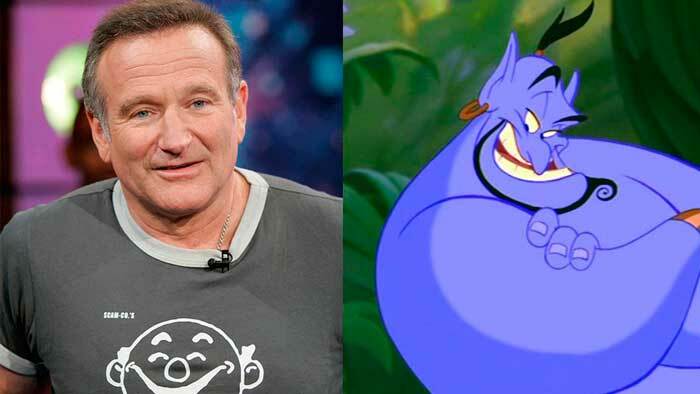 Robin Williams is still well-remembered due to his exceptional talent and ability to make us laugh. At his time he was looked upon as one of the outstanding stand-up comedians from whence he progressed to becoming a stupendous movie and television actor. Not only did he succeed in playing funny characters but he tackled dramatic roles as well and became an accredited versatile performer famous for his participation in a number of memorable flicks such as Jumanji, Good Morning, Vietnam, and One Hour Photo. Notwithstanding, Williams never relinquished his stand-up shows. Many people were burned when he chose to quit this life four years ago, yet he left behind an unforgettable legacy of excellent work that withstands the ravages of time. Besides his noteworthy work on screen, he led an exciting life outside sets and stages. His biography would have made electrifying reading. His admirers are sure to discover intriguing facts about the comedian’s life they didn’t know about. Some of them (but not all!) are to be found below. See how thrilling can a celeb’s life be. In mid-70s the future comedian spent three years in the Juilliard School in New York City. It was already obvious that he had more than average talent. 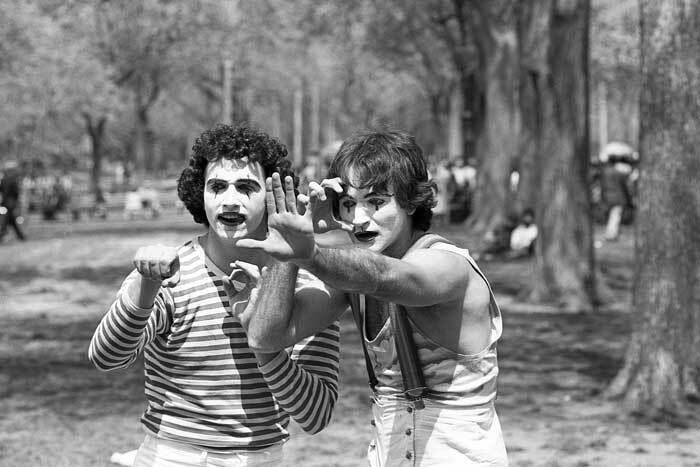 Apart from his studies he went to the Central Park where he performed as a mime, often in company with a fellow performer named Todd Oppenheimer. They were so good they even got themselves photographed by one Daniel Sorine in 1974. At the time Williams wasn’t popular, and the photographer made the picture just because he liked the show. It wasn’t until much later that he recognized Williams as one of the performers on an old photo. After three years at school Williams decided that he wasn’t developing as he would like to, so he quit Juilliard and moved back to San Francisco. Unfortunately, there was no work for him there. When he spotted an advertisement for a comedy workshop – in a church of all places! – he thought he might just as well apply. Yet it turned out to be not an acting workshop as he hoped but a stand up comedy show with a church’s basement as a venue. The comedian signed up and proved his worth making a good start of an exemplary career. 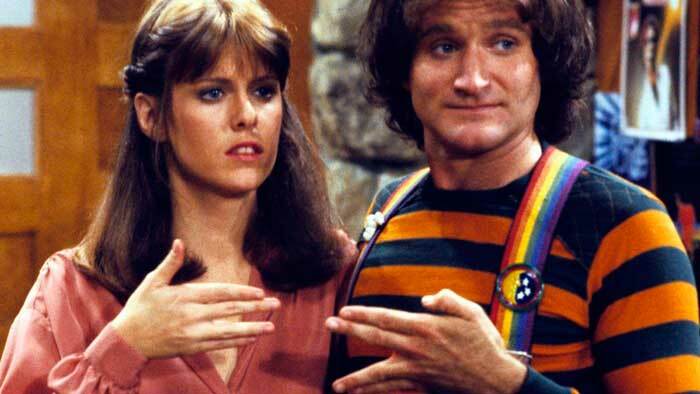 Williams’s first big claim to fame was his appearance in Mork & Mindy (a spin-off of Happy Days) where he played Mork. The series started in 1978 but the actor was on since Happy Days season five. Yet he wasn’t the first to be picked for the role. There was already an actor selected for the part but he didn’t like the script. So he turned down the offer and thus sent the producer, Gary Marshall, on a frantic search for a replacement. Then he came upon Williams and was impressed. 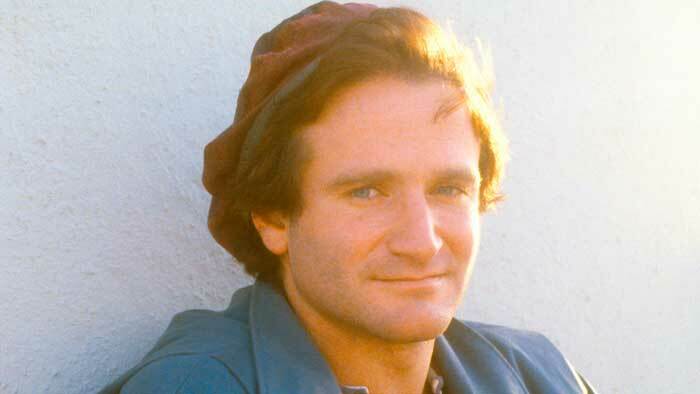 Apart from acting Robin Williams had many other hobbies. Not all of his fans know that he is very fond of cycling. There was a time when he made up his mind to take some serious training and so he appealed to Lance Armstrong who was his friend. Armstrong is known to be an awesome cyclist although he is not the easiest person to get along with. He agreed, and Williams turned out to be a fine cyclist. 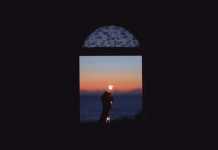 It remained one of the greatest passions throughout his life. In 1992 Disney released the animated film Aladdin which went down so well with both critics and general public that it virtually proclaimed the Disney renaissance. 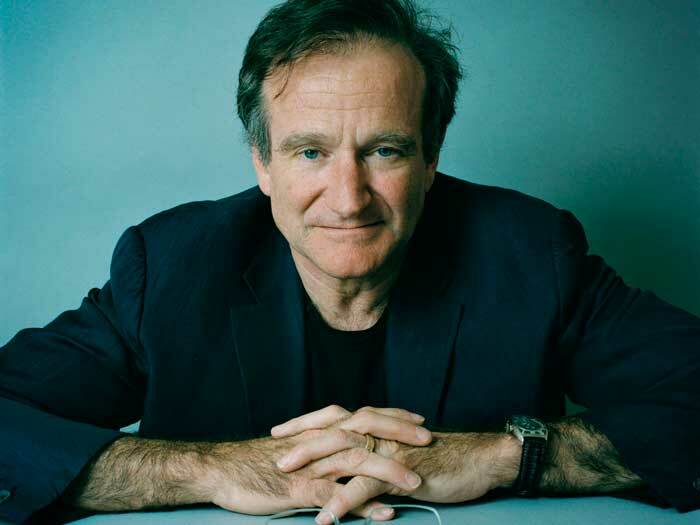 One of the movie’s great features was Robin William’s voice acting, and his success triggered off the trend of celebrities doing voice acting. Before that famous actors didn’t use to do voice – it was the field where professional voice actors dominated. But a subsequent study revealed that in the wake of Williams’s brilliant performance celebrities flooded in and did far more voice acting. 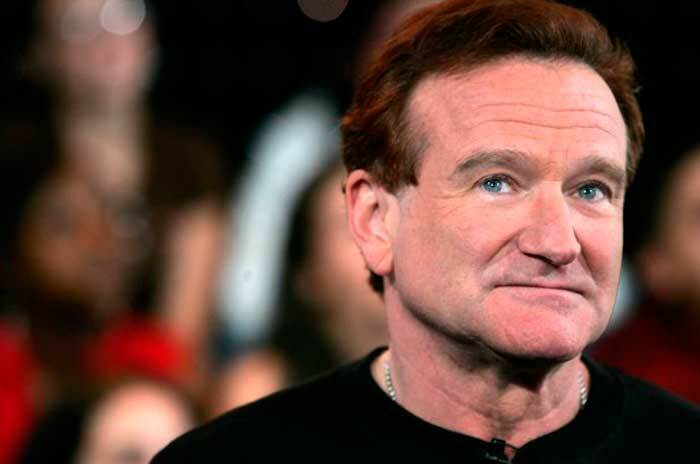 True, Robin Williams became a celebrity, but that didn’t mean he didn’t have to pass auditions – or be rejected. That’s exactly what happened when he tried to get on the set of the movie Midnight Run. He wanted the part of Jonathan “The Duke” Mardukas so much that he auditioned for it a number of times. Eventually Charles Grodin was chosen for the role, and Williams came to agree that he made an excellent Mardukas, a better one than he would have made, yet he couldn’t but feel burned and had to convince himself he had other fish to fry to get over the disappointment. Robin Williams achieved stardom when the 80ies were coming to an end; he made a name appearing in blockbusters and touring the globe. It was not common for such celebs to go to Broadway all of a sudden, but Williams was tempted to join the cast of Waiting for Godot by Samuel Beckett alongside Steve Martin and F. Murray Abraham. Discussing this decision with The New York Times he said he felt sure there was no risk for his career – he never gave it a thought but concentrated on his acting. All the way up Williams had to cope with fits of severe depression. As he rose to fame working on Mork & Mindy, he also had to labor under a lot of stress thereby aggravating his condition. In order to keep his depression at bay he resorted to addictive stuff (cocaine and alcohol). Afterwards he had to control his addictions with the help of rehab treatment. Still, personal issues plagued him until the very end. 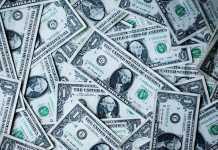 While many celebs make a point of buying only the latest and most expensive things, Williams remained quite a simple individual who relishes life without splurging a lot of money. At least he never had a thing for cars, filling his garage up with the best makes – even after he became famous, he held on to his old Land Rover from the year 1966. 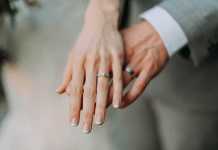 He commented that he would never prefer newer cars because that one was just like him – “you never know what’s going to happen next.” He was as good as his word and never bought a Ferrari staying loyal to his car. 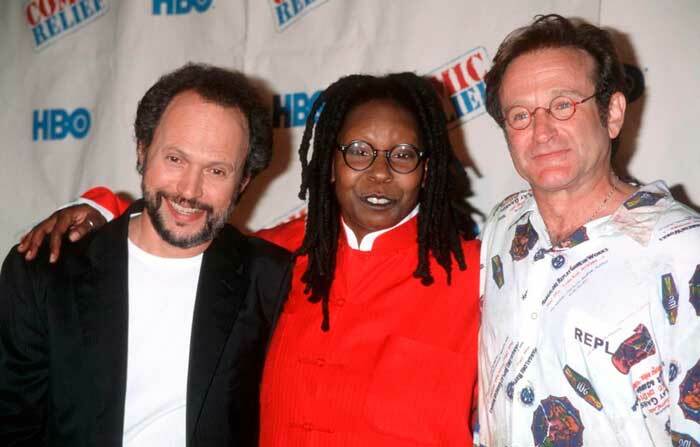 An amicable and gregarious person, Williams made many friends, and his close circle included Whoopi Goldberg and Billy Crystal. They all raised funds for charities by founding and hosting Comic Relief USA on HBO. After the comedian’s disease the two gathered on The View to exchange recollections of their great moments together. Crystal said they had often been talking over the phone for hours on end. Sometimes they would make out they were somebody else. When Crystal was over on Broadway, he kept receiving messages from Williams pretending he was a hairdresser called Gary. In his childhood Williams was very timid and somewhat overweight; not many children chose to be friends with him, and to all intents and purposes he had to get by without friends. His playtime was his own and nobody else’s. Left to his own devices, he learned to find entertainment and fun himself. He began to play in impersonation trying to speak in different voices and making out he was some celebrity or another character. This kept him amused and prepared him for his subsequent career. 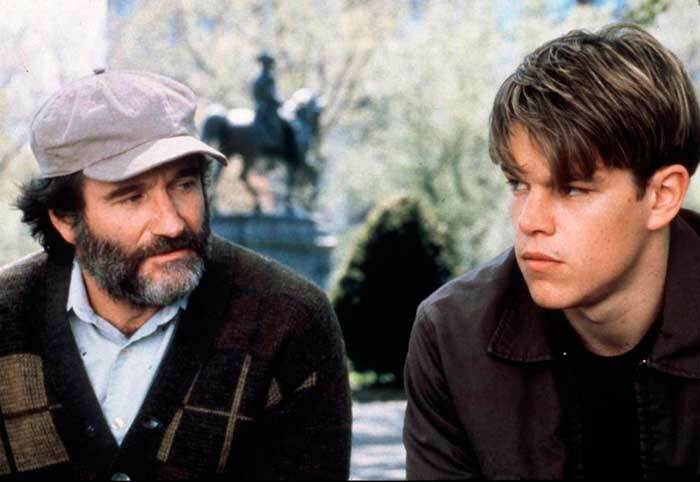 One of Robin Williams’s spectacular successes was his starring in Good Will Hunting for which he received an Oscar. There the comedian couldn’t help improvising (again) and took his co-star Matt Damon – as well as the rest of the set – by surprise by telling a highly fictitious story of his wife who farted while sleeping. His partner in the scene, Damon, laughed out heartily and sincerely, while the crew were stifled with mirth. Actually he had the cameraman shaking with laughter so much that you can see the camera move uncontrollably during shooting. As we already know, Robin Williams was unprepossessing of appearance and shy by nature when at school. He managed to shake it off only when he began to act. But in high school his talents weren’t at all evident, and his Redwood High School yearbook stated that young Williams was generally regarded to be the one “least likely to succeed.” Now we know that the students couldn’t be more wrong. They turned their backs on a boy who grew up to be a world-famous comedian and an acclaimed actor appearing in many iconic movies. He was also among the highest grossing entertainers of the time. Williams is a legendary figure who will continue to delight us for years to come. What Kind of Sports Shoes Do You Need?